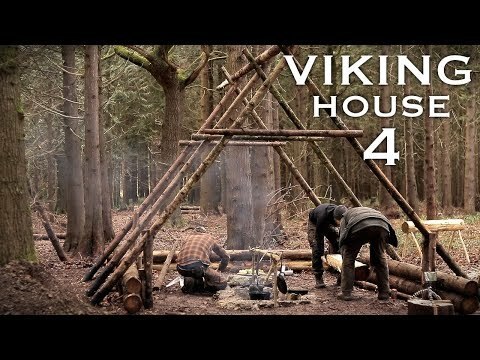 We continue building a bushcraft viking house in the forest using hand tools only. Part 4 focuses on using the axe, auger and draw knife to build a viking bench, saw horse and spit for the stone clay fire pit ready to roast meat over the fire. Now that the cedar log foundations are in place, and the timber frame has been built, we are able to focus on making viking furniture such as the saw horse and bench using traditional woodworking techniques and hand tools. We use a draw knife to take off the bark of the cedar logs to help preserve them and prevent bugs and water from rotting the logs. I use an auger to drill holes for the legs of the saw horse. We then use a sledge hammer to drive in the legs. Using an axe and some wood wedges we also split a cedar log to make a bench for inside the viking house. We cook up food over the fire, this time southern fried chicken in the cast iron dutch oven over the viking long pit. In Part 5 we focus on finishing the wood frame roof of the Viking House. We build the rafters, and build some pirlins too. As well as begin collecting the cedar bark ready for the cedar shingle roof. Thanks for watching and be sure to subscribe so you don’t miss the next episode! Wilderness Survival Tips : How Long Can People Survive Without Food in the Wilderness?